If you are planning to start a live weather forecast website or application or using a weather application yourself on your phone or desktop, the icons are what really makes it look beautiful. The better they look, the stylish the phone’s interface looks which should be one of your main objectives. There are various styles to choose from, starting from solid icons to line types, each for different types of users with different choices. 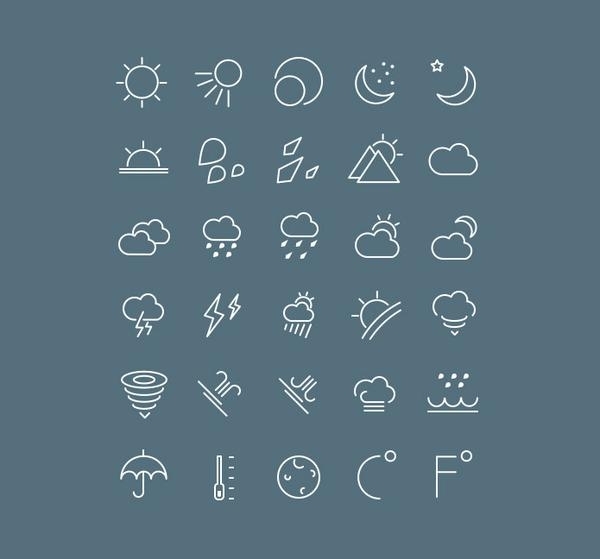 In this set there are 30 different types of icons at 300dpi to show the different types of weather conditions which occur. They are simple and look stylish on darker backgrounds. There are icons for sunny, rain, hail, snow, storms, light rain, heavy rains, cloudy, etc. and can be a good addition to your interface. These are flat weather icons with a solid color and have mainly 6 types of different icons, they are, sunny, cloudy, snow, rain, thunderstorm and clear night sky. Even though the options here are less, the size is small while the quality is 300dpi and is useful if you do not require detailed weather reports. This icon pack consists of 8 different icons which signify the weather in terms of cloud situations as seen in the sky. They are also lightweight and simple, drawn with lines. They have, light cloudy, sunny, very cloudy, snow, rain, partly sunny, etc. You get this at 300dpi resolution. There are 8 types of icons in this package which are flat and solid at 300dpi resolution for your convenience. They even have a diagonal shadow texture in the icons and are round in shape. The icons in this pack can be used in both light and dark backgrounds on phones and desktops. There is a total of 25 icons which you can get at 300dpi resolution and they use a variety of colors for each weather elements like, blue raindrops, yellow sun and thunder, 7 color rainbows, etc. They are generally white in color, drawn in lines only, but are not more than 300dpi which are good for this type. They have a slight difference than other types mentioned, in their point of representation in case of some weather conditions like blowing umbrellas in case of windy weather and a spiral tornado in case of similar storms. They are one of the perfect additions to bright colored backgrounds except really dark ones since their shades are in black. They come in a pack of 40 different kinds of detailed weather conditions. The 300dpi resolution makes it look crisp. It is similar to weather applications used in android phones, this can be a premium addition to your desktop. There are 8 icons in total and uses a good combination of colors, downloadable at 300dpi resolution. This one is unique in its own way due to its structure of designs. They are decently designed in 300 dots per inch resolution. They come in 30 different types and have a variety of cloud conditions to depict the weather.